April | 2015 | The British in Crete, 1896 to 1913. A Minor Mystery – solved? Avid readers with good memories will recall that a few weeks ago I posted the photo above and suggested for several reasons that it may not have been taken at Kandanos in 1905. Thanks to the wonders of the interwebnettythingy I can now confirm what many people may have suspected all along; I was talking nonsense. The large building is what remains of the castle Kandanos after the evacuation of Ottoman troops in 1897. The smaller building on the left is part of the current elementary school. The building on the right is the former County Court. The main building was the Government House (Seragio), in which lived the last Governor of Selinos Province, Saddam Genitsarakis; Genitsarakis later served as Mayor of Chania and Minister of Public Order of the Cretan State. Between 1897 and the Second World War, the site, which backed onto a large Muslim cemetery (Mezaria), was occupied by the Gendarmerie station. The site is now occupied by the Kandanos Town Hall and Municipal Offices. 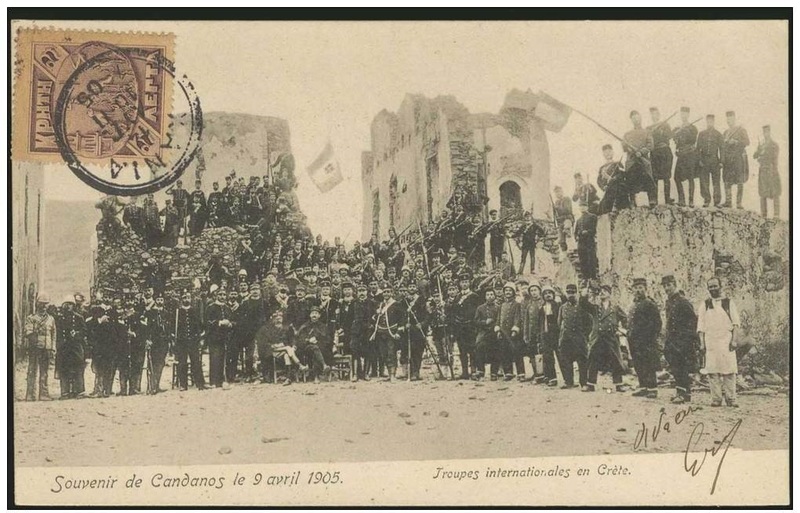 While I still can’t work out why British, French and Italian troops all appear in the picture at the same time, several local Cretan historians have confirmed that the photograph was taken in Kandanos on the occasion of the Cretan elections in 1905. The troops were sent there to prevent factional fighting between supporters of Prince George, the European appointed High Commissioner, and Eleftherios Venizelos, his main political rival. This entry was posted in European Intervention Crete and tagged European Intervention Crete on April 23, 2015 by Mick McT.